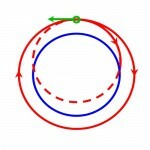 My last two posts were describing – very basically – how orbits work. They described how when something is orbiting around the Earth in space, it’s really just continuously falling, but going fast enough that the ground drops away underneath it as it goes. They also talked about how two objects – regardless of weight – will fall at the same speed; remember the hammer and the feather on the moon? This means that they must be travelling at the same speed (i.e. have the same velocity) in order to stay in orbit. But what if one object was in the same orbit as another object, but was much farther behind it? How would it catch the other object? Answer: slow down. Slow down?! Slow down to catch something in front of you? What? Let me explain. First, I’d quickly like to talk about how orbits are just circles (technically, ellipses) and by changing our velocity, we’re simply changing the size of our circle (orbit). Remember that an arch is just a small piece of a complete circle. So, if we continue to draw the arch of the path that is returning to Earth, we get a complete circle (see the dotted line?). 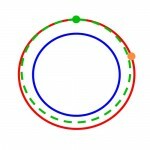 What this illustrates is that speeding up or slowing down just changes the size of our orbit circle. So how does slowing down help us catch up to something else? 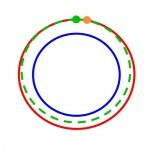 Let’s imagine two objects in the same orbit; one is at the top of the orbit (green) and the other is on the right side (orange). Let’s just say this orbit is 10 units long. 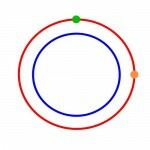 If the green guy makes his orbit 9 units long, he’ll end up back at his original point before the orange guy does because the orange guy has farther to go. Think of it as having the inside track in a race; the inside track is smaller than the outside track so you don’t have to go as far to win. After a few complete orbits, he’ll have caught up with the orange guy! 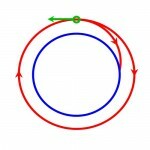 It sounds counter-intuitive, but slowing down in orbit actually makes you go faster! Just remember that whenever you see those space scifi movies where spaceships are zooming around like jet fighters on Earth… things don’t really move like that in reality. When you’re in space, you’re in some type of orbit around something. Always. Gravity doesn’t go away, but it does get less intense the farther you are away from an object. Oh, and everything has gravity… even you and me. Want to learn more… and have fun doing it? Play Kerbal Space Program. Seriously, do it now! It’ll teach you everything I just said, but much better and you’ll have a lot more fun doing it.